Interested in the history of antique and vintage jewelry? Read on to learn more about the years and periods from 1836 through 1950. Each jewelry period tells a bewitching story! Flowers, hearts, bows and birds inspired beautiful pieces of jewelry which showed the craftsmanship of the Victorian age. Serpent motifs were also popular. 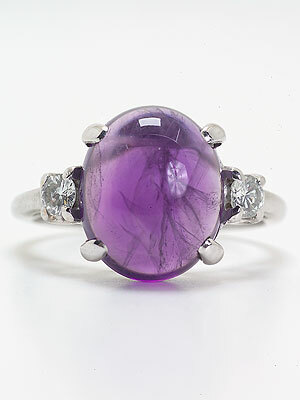 Gemstones were often used during the Victorian period and helped keep jewelry affordable for the mass market. Garnets, amethysts, corals, turquoise, and seed pearls were in style. Opals were increasingly popular as Queen Victoria adored them. Diamonds were discovered in South Africa in 1867 and became popular during this period. Human hair was also incorporated in jewelry during the Victorian Period. This jewelry was given as a token of love and also worn as mourning jewelry. Learn more about the Victorian jewelry period and decide if a Victorian ring is perfect for you. The Art Nouveau period began circa 1890 and ended around 1919. This period represents the turn of the century and the coming of the "modern age". The feminine form was highly celebrated, as were soft curves, sinuous lines, and pale colors. The representation of the female head with long flowing hair is prevalent during the Art Nouveau period. Nature motifs also remained strong. Butterflies, dragonflies, snakes, poppies, orchids, irises and water lilies prevailed in jewelry design. Jewelry which was created during the Art Nouveau period embodied art for the sake of art, as well as a dramatic trend in fashion. Free flowing asymmetrical lines were important and emphasized the designers innovative skills. Because materials were not as important as design and craftsmanship, a number of varied gemstones were popular. Amber, opals, moonstones, citrines, and peridots were used along with other interesting materials like horn, copper, tortoise-shell, ivory, carved glass, shells, pearls, and gemstones cut in cabachon. Learn more about the Art Nouveau jewelry, which embraced nature and art above all else. You just might fall in love with an Art Nouveau ring! The Edwardian Period lasted from 1901 to circa 1920. Edward VII and his lovely Danish bride, Alexandria, brought a cosmopolitan flair to fashions and jewelry during this exuberant time in history. Jewelers used platinum and diamonds to create intricate and delicate filigree patterns that resembled lace. 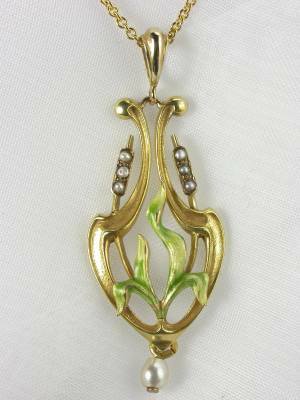 Light and airy designs became hallmarks of Edwardian jewelry. Alexandria wore a choker type necklace called a "dog collar" which became popular during the Edwardian period. Pearls were quite fashionable, along with jewels for the hair, or "tiaras" combined with beautiful dangling earrings. King Edward enjoyed sports and encouraged the use of sporting motifs. He also helped make his good luck stone, the peridot, very popular. The elegance, beauty and superb craftsmanship of Edwardian jewelry has remained unparalleled through the ages. Learn more about the Edwardian jewelry era. You'll be enchanted by this romantic period in history and the intricately designed antique engagement rings crafted during this time. The Art Deco Period, which began circa 1920 and ended around 1935, produced dazzling jewelry which was in sharp contrast to the jewelry of the previous periods. The emphasis shifted from soft colors and flowing lines to bold, bright colors and straight lines. Women cut their long locks and began wearing their hair short and boyish. This was the era of Jazz and flappers. Art Deco jewelry complimented the flamboyant and playful attitude of the day. Egyptian influences were strong and motifs like the sphinx and falcon were popular. 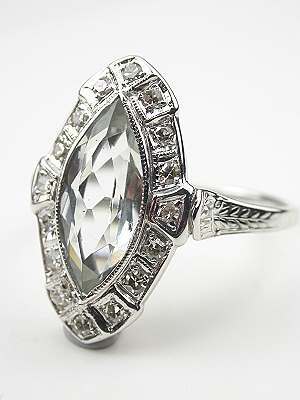 New geometric cuts for gems went hand-in-hand with the symmetry and streamlined look of Art Deco jewelry. Long earrings were popular, along with diamond watches, pearls, beads, and cocktail rings. 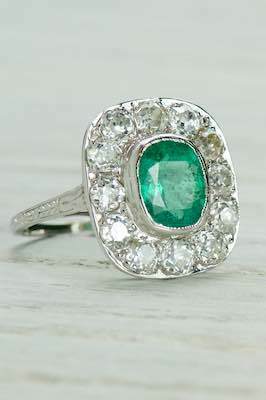 Emeralds, sapphires and rubies became the gems of choice in Art Deco jewelry. Learn more about the Art Deco jewelry period and the tremendous impact this era had on jewelry, fashion, art, and architecture. Many stunning engagement rings are from this period. 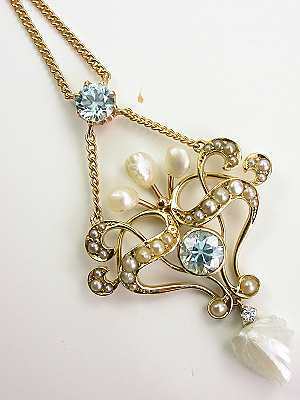 The Retro jewelry period began in the 1930s during the depression years and lasted until 1950. Jewelry during the Retro period is characterized by chunky styles, that showcased large colorful gemstones in oversized, rectangular cuts. Synthetic rubies and sapphires were popular along with citrines and aquamarines. Yellow gold became the metal of choice as platinum was not available to the jewelry industry during World War II. Designers opted for multi-colored jewelry pieces in tasteful combinations of rose, yellow and green gold. Charms came into vogue during this era and were worn in large quantities on link bracelets. Illusion settings in engagement rings, with elaborately carved settings, gave the look of a much larger diamond for a modest price tag. These beautiful pieces were favored by the economy minded women of the 1930's and are just as popular today. Tiffany, Cartier, and Van Cleef & Arpels made their mark on the jewelry world with bright and fashionable jewelry which appealed to the Hollywood set. These designer pieces are highly collectible to this day. Learn more about the Retro jewelry and how you can make this historical period part of your personal style.